The last Wednesday of the Month (except July and August) at Eady United at 12:30 p.m. a number of ladies get together to knit/crochet Prayer Shawls and Handfuls of Hope. Our next meeting will be on May 29, 2019 The shawls are given to those who are ill, grieving, congratulations such as baptism, confirmation etc. The Handfuls of Hope are given to those who would prefer a smaller item. They can be held while awaiting surgery, bereavement, etc. when you just need a little something to hold on to. Since the beginning we have distributed 228 shawls and 6 Handfuls of Hope. We would be happy to have you join our group. Wesley United, Eady UCW Ladies next meeting, at the church, will be on May 29, 2019 at 1:30 p.m.. Meeting will be followed by afternoon tea. Coldwater UCW Ladies will meet on June 3 at 9:30 a.m. (place of meeting to be determined). Christian witness, study, fellowship, and service. 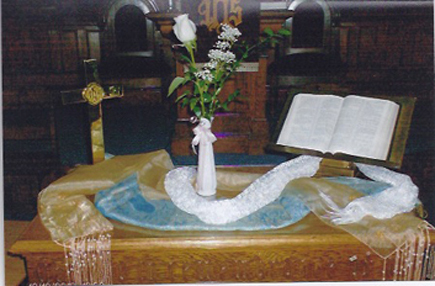 The members of the United Church Women from the Wesley (Eady) and Coldwater United churches are the proud sucessors of the original women's church groups that were formed in the late 1800's . 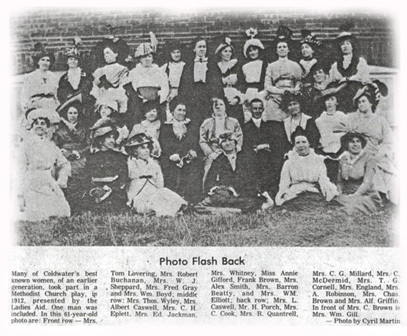 The first church women's groups were the Woman's Association or the Ladies Aid, depending upon which Methodist church they belonged to, and the Woman's Missionary Society. These women were members of the original Methodist churches which became part of the greater United Church organization. In 1962 the original Woman's Association, the Ladies Aid, and the Woman's Missionary Society were combined together under one common title of the United Church Women. 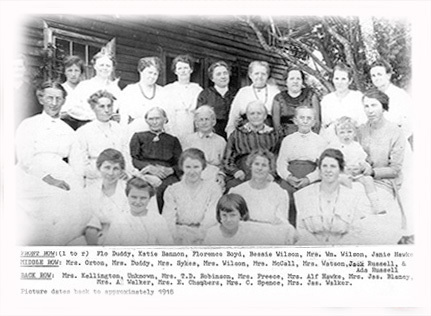 Many of the best known women, of an earlier generation in Coldwater, beside the Coldwater Methodist Church. Many of the ladies in the picture were members of the Coldwater Methodist Church Ladies Aid organization. Wesley (Eady) United Church Women and Coldwater United Church Women celebrated this important occasion in very similiar ways at their respective churches. 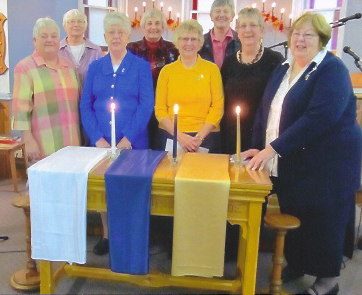 On both occasions the UCW members conducted the church service and displayed the UCW colours.